In the early months of this year, tens of thousands of unaccompanied Central American children poured over the U.S. border, creating a new crisis in the ongoing and polarized debate over immigration reform. The flood of children also brought a broad and growing coalition of evangelical Protestants to a new and surprising place: the brink of a confrontation with the GOP-dominated U.S. House of Representatives, which during the summer declined to act on immigration law or to increase spending to care for the children crossing the border. In 2013, a newly visible evangelical coalition had given broad support and political cover to Senate Republicans, who eventually joined the Senate’s Democratic majority in a bipartisan immigration reform bill that proposed to open a path to legal status for many of the nation’s 11 million undocumented or illegal aliens, while increasing spending on border security. A year of intense lobbying followed, but in the end evangelicals could not move House Republicans or bring themselves to publicly denounce the House GOP’s refusal to act. 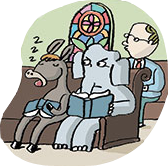 The day may come when, in Wear’s words, evangelicals will feel comfortable “aligned with Democrats and prodding Republicans to do what they think is the right—and moral—thing.” But it has not arrived yet. Over the past three decades there have been few political alignments stronger than that of white evangelicals and the GOP. Over that period, roughly 80 percent of evangelicals have voted Republican in presidential elections, constituting about 40 percent of the party’s voter base. And suspicion of immigration is embedded deeply in the Republican Party’s genes, dating to its origins in the 1850s. Nevertheless, the children on the border heightened the sense of crisis over the summer. Michael Paulson of the New York Times noted on July 21 that the nation’s Roman Catholic bishops and many of its most prominent evangelical leaders were “among the most agitated” about the nation’s failure to do more to aid children fleeing violence and poverty in Central America. The emergence of Moore—the Southern Baptists’ top public policy spokesman since March—as a vigorous public proponent of a path to citizenship for undocumented aliens coincided with the public emergence of the evangelical pro-immigration reform movement. The compulsively quotable Moore also attracted attention from journalists because he admitted that many of the most resolute opponents of immigration reform are themselves evangelicals. Before the mid-2000s, little was heard from white evangelicals about immigration reform. Latino evangelicals, for example, got scant support when they tried to rally evangelical support for an earlier attempt at immigration reform in 2006. Evangelical hostility to immigrants and immigration reform began to change for a variety of internal reasons. In the early 2000s, many megachurches began to open Spanish language mission operations. At Willow Creek that began with outreach to Chicago area Hispanics in 2002. Measurable change began in the upper reaches of the evangelical world in 2007, when the Rev. Leith Anderson, a Minnesota megachurch pastor, announced that he wanted to make immigration reform a key policy priority during his term as president of the National Associations of Evangelicals, the largest umbrella organization in the sprawling evangelical organizational world. In 2009, the NAE produced a “consensus statement” supporting comprehensive immigration reform that would lead to citizenship for many undocumented immigrants—a stance not shared by most Republicans. The Southern Baptist Convention, the largest American Protestant denomination, followed suit with a call for “path to citizenship” in 2011. The shifting mood also registered in local congregations. “Immigrants are really changing the face of the religious landscape of the United States,” the Rev. Wesley Granberg-Michaelson, general secretary of the Reformed Church in America (itself the product of 19th-century immigration from Europe), told Lourdes Medrano of the Christian Science Monitor on April 29. Granberg-Michaelson herself had just published From Times Square to Timbuktu: The Post Christian West Meets the Non-Western Church, a book arguing that immigrants are the future of American Christianity. One example of the new reality cited by Granberg-Michaelson is a Columbus megachurch with 9,000 members, 28 percent of whom are immigrants and refugees from 104 nations. Julia Preston of the New York Times interviewed a large number of white evangelicals in Florida for a piece published on April 13. In it, many church members said their views on immigration had changed significantly as a result of personal contact with immigrants who now worship in their congregations. As they met the immigrants, the white evangelicals learned about their struggles with the legal system, including the devastation caused by deportations that often divide families. (There have 2 million deportations in the Obama years.) In many immigrant families, some members are legal immigrants or citizens and others are not, so even legal immigrants often live in fear of immigration enforcement officers. Preston quoted Steward Hall, a 70-year-old member of First Baptist Church in Orlando, whose perspective on immigration began to shift when he moved “to sit in the pews at the rear of the church where immigrants new to the congregation choose” to worship. “Take me back 10 years ago,” Hall said, “and I had this really hard shell about it. Line ’em up and shoot ’em, and by that I really mean pack them up and get them out of here.” But, he added, personal acquaintance with immigrants and their families, and “my walk with Christ” had softened his views. In the first decade of the 21st century, most discussions about immigration and immigrants took place out of mainstream view, within the relatively sheltered world of evangelical organizations, media, and conferences. An important turning point was marked by publication of Welcoming the Stranger: Justice, Compassion and Truth in the Immigration Debate, a volume published in 2009 by Mathews Soerens and Jenny Hwang Yang, both employees of World Relief, a development arm of the National Association of Evangelicals. Soerens and Yang crisscrossed the country, building support for immigration reform that opened a path to citizenship and creating new political networks. At the heart of their message was an insistence on the dignity and worth of immigrants and the powerful reassertion of Jesus’ instruction to his disciplines in the Gospel of Matthew that “whatever you did not do for the least of these, you did not do for me.” Soerens became famous in evangelical circles for noting that the Old Testament contains the Hebrew word ger (stranger) no fewer than 92 times. It’s worth emphasizing that this activism originated in a part of the evangelical world that supports global mission work. By 2010, evangelical participation in the Immigration March on Washington was noticeable to outsiders and a groundswell of support for immigration reform was shaping opinion at many of the nation’s evangelical colleges and universities. In 2011, a national student conference at Cedarville University in Ohio, endorsed broadly by evangelical organizations and leaders, produced the G92 Fellowship, a grassroots organization whose website (G92.org) promotes the establishment of local student groups. It also disseminates a host of material designed to allay popular concerns that illegal immigration is bad for the economy, promotes law breaking and law breakers, and that immigrants, especially Spanish speakers, refuse to learn English. A measure of the new cause’s popularity was that the very socially conservative Focus on the Family organization rushed to join in the last hours before the group was publicly announced. The most prominent evangelical complaint about current immigration law is that enforcement often shatters family life—dividing spouses, parents and children from one another. The rise of EIT and organizations like it triggered an intense discussion in the media during the 2012 presidential campaign year about whether new “values positions” among younger evangelicals on immigration and environmentalism might lead to political realignment. Although that never materialized, in 2013, the EIT and other groups did amp up their campaign for new immigration laws in the context of a second Obama administration. This provoked a strong counter-reaction both inside the Republican Party and among evangelicals not behind the pro-reform program—hardly a surprise in the complex, feisty, and disputatious world of American evangelicalism. Marjorie Jeffrey of the Institute for Religion and Democracy (IRD), a conservative culture warrior over the politics of Christian social justice, weighed in with a blog post on June 5, suggesting that the EIT’s evangelical bigwigs were dupes of plutocrat George Soros and his leftist National Immigration Forum. “But there remains the nauseating fact that some Evangelicals are peddling a new sort of liberation theology to American Christians, aided by a man (Soros) who has actively supported and financed organizations that directly go against Evangelical beliefs about marriage, abortion, euthanasia and embryonic stem cell research,” she wrote. In response, the Washington-based IRD and other committed conservatives fostered the development of a group to challenge the EIT, called Evangelicals for Biblical Immigration (EBI), which hewed to an anti-Obama line. Its founding manifesto in June 2013 attempted to refute of the EIT’s brief for a biblical mandate for immigration reform. EBI exhorted evangelicals to “consider the whole of Scripture” at least partly because most explicit Biblical discussion about immigrants and the poor, in both testaments of the Bible, are so unequivocal in demanding hospitality and unconditional support for the poor and immigrant. Those who counterpose Romans 13 to the raft of Biblical exhortations to help the poor and the stranger tend to begin their analysis by arguing that undocumented immigrants are law breakers who can’t be assisted without undermining the rule of law. And, as with EBI, the next step is usually to emphasize that citizens of the United States must also be treated justly and protected from unfair competition. Of course, the leaders of the Evangelical Immigration Table are well aware of Romans 13 and much of the material produced by the group addresses that text and tradition. A video featuring Richard Land’s handling of the interpretive problem is on the group’s home page. Land reviews the Biblical mandates to care for the poor and immigrant and treats them as irresistible gospel imperatives. He then moves to speak respectfully of Romans 13 and then says that he and others want a new immigration law that deals forthrightly with the fact that current law is irreparably broken. What they don’t want, he said, is amnesty. A better law would secure American borders, take measures that make it impossible for illegal immigrants to get jobs and for employers to hire them, ensure that immigrants all learn to speak English rapidly and ensure that law-abiding immigrants have a chance to gain citizenship after paying some meaningful penalty for breaking American law. Hundreds of prominent evangelical pastors, mustered by EIT, descended on Washington in April 2013 to lobby House GOP members. And during the summer and fall of that year, EIT, G92, and other pro-immigrant evangelicals worked hard to persuade House Republicans to act on a bill comparable to the one passed by the Senate and endorsed by the Obama administration. They adopted vigorous mobilizing campaigns, including “Pray for Reform,” a million dollar radio advertising campaign focused on congressional districts with Republicans incumbents for two weeks in August in states like Texas, Oklahoma, North Carolina, and Ohio. Lobbying conservative Republicans hard for something that they didn’t want to do was new and uncomfortable for many pro-immigration reform evangelicals. They wished that immigration reform had bipartisan appeal. “It’s been my experience that there have been individuals on both sides of the aisle who understand the need for comprehensive reform,” Rev. Harvey Clemons, pastor of Pleasant Hill Baptist Church in Houston, told Allan Turner of the Houston Chronicle on May 25. “This is not a Democratic problem or a Republican problem, it’s a United States problem. The individuals who understand it and are willing to work on it are in the minority,” he added gloomily. The “Pray for Reform” campaign failed to move a significant number of House members, who listened to hometown pastors politely, but didn’t change their positions. In the fall, hopes turned to persuading House Speaker John Boehner of Ohio, who favored at least some form of immigration reform, to lead an adequate number of Republicans to vote in favor of reform along with House Democrats. But in December, Boehner made it clear that there would be no House action on immigration in 2013 and said he would not support a comprehensive bill in 2014. Instead, he would support a “common sense, step-by-step,” approach, he told Roxana Kopetman of the Orange County Register in southern California on December 13. In early 2013, some House Republicans floated the idea of immigration reform that gave undocumented aliens with no criminal records some form a resident alien status rather than a path to citizenship. But neither House Republicans nor many evangelicals liked that approach either. Most House Republicans paid attention instead to militantly mobilized and anti-reform Tea Party supporters. Additionally, they were reluctant to give the Obama administration any kind of political victory in a year when Republicans felt that the midterm elections would go their way in both the House and Senate. In 2013 and 2014, pro-reform evangelicals were functionally allied with “establishment” Republicans (usually meaning Republicans who held high office during the Bush years) and with business leaders who wanted reform. Beginning soon after President Obama’s re-election, establishment Republicans, personified by Karl Rove and Republican National Committee chairman Reince Priebus, warned without substantial immigration reform, Latino voters, the fastest growing sector of the electorate, might be permanently alienated from the party. But as the House of Representatives failed to act and some Republicans suggested a path to residency but not citizenship for undocumented aliens, the small evangelical majority for reform began to slip away in the early months of 2014. Most observers believed that highly mobilized Tea Party voters were behind the House’s inaction—a perception heightened by House Majority Leader Eric Cantor’s primary defeat by a Tea Party-backed, anti-immigration reform candidate in June. While many journalists portrayed the Tea Party’s constituency as libertarian, polling consistently showed Tea Party voters identifying far more with evangelical Protestantism than libertarianism. Surveys by Pew and the Public Religion Research Institute (PRRI)/Brookings Institution have consistently shown that a bit more than 50 percent of Tea Party voters say they are evangelicals, but only about 20 percent describe themselves as libertarians. “Republicans overall are more likely to be white than the general population and Tea Party Republicans are more likely than non-Tea Party establishment Republicans to be white, male, older and evangelical Protestant,” Robert P. Jones of PRRI wrote on June 12 on Atlantic.com. That cultural world was the overwhelming white majority society of the middle decades of the 20th century, when immigration was sharply restricted. “It is often said that evangelicals are not monolithic on immigration,” Gerson wrote. “The reality is more troubling to the faithful, or should be. Their views on immigration are less a function of their religious beliefs than of their group identity.” Like other establishment Republicans, Gerson argued that the party’s future rests largely on expanding its base of voters to include socially conservatives Latinos, who won’t vote for an anti-immigration party. Surveys by PRRI/Brookings added support this spring and summer to the thesis that Tea Partiers (who are mostly evangelical males) are implacably opposed to immigration reform. Writing in Atlantic.com August 8, Daniel Cox considered the refusal of House Republicans to hold a vote puzzling, “given America’s high level of support for comprehensive immigration reform.” Overall support for a path to citizenship reached 62 percent in July, with an even higher proportion backing action to assist unaccompanied children on the border. The Tea Party’s evangelical core “represents constituencies haunted by anxiety associated with the perception that they’re ‘losing the country’ to immigrants from south of the border,” Cox wrote, quoting University of Washington political scientist Christopher S. Parker. In retrospect, the evangelical campaign in support of immigration reform and a path to citizenship probably peaked in April, with the congressional lobbying campaign of the EIT pastors. As the summer passed, evangelical pressure on House Republicans faded away. If evangelical supporters of immigration reform haven’t changed their minds, neither have they figured out how to persuade a significant mass of their co-religionists. The evangelical friends of immigration reform include many of the movement’s institutional leaders, a large share of younger evangelicals, and of course immigrant evangelicals. Evangelical political preferences are already divided by race. Black and white evangelicals have completely opposite voting preferences. In the not too distant future, younger white evangelicals may break their allegiance to the Republican Party and move into a less-aligned place in association with the rapidly growing number of immigrant evangelicals. Another possibility is that most white evangelicals will stay tightly bound to the Republican Party because they are most effectively mobilized by anxieties about the changing demography and culture of the United States. “Overall, making this racial shift salient could bring more moderate white Americans into the Republican Party, as well as increase turnout among white Americans who already consider themselves Republicans,” Maureen Craig told Edsall. Under either scenario, the breakup of the white evangelical vote or the mobilization of whites around anti-immigrant, anti-minority politics, white evangelicals will have to deal with their now-evident internal divide between those who view immigration reform as a pressing and universal requirement of the gospel and those whose religious commitments are tempered by their politics and loyalty to an older vision of American identity. Given the chasm that might well be opening before them, it is not altogether surprising that pro-immigration evangelicals fell silent in July as the House refused to act. But the circumstances that led so many of them to back reform—most of all the deportations that devastate families, including families in their congregations—aren’t going away. ← Religion in the News is Dead! Long Live Religion in the News!